The mental aspect of kicking does not start when the coach calls for the field goal team. By the time you are called on to attempt the game winning field you have already been there 1000 times before. Not physically, but mentally. Complete confidence in your ability to perform will lead you to success. But, how do we gain confidence? Do you visualize yourself in successful situations? Do you feel nervous or anxious when asked to kick a field goal? Do you know how to tune out distractions and have complete focus? How to prepare yourself on game day. How to control and channel your nervous tension. Developing a positive, confident mindset. If you don't have a goal in mind you can never accomplish it. The target point is important because it gives your mind a focal point and goal to reach. Choose a small non moving target. With normal weather conditions, the target should be directly between the uprights. The target should be higher than the uprights. NOW, CHALLENGE YOURSELF TO HIT THE TARGET........NOT TO MAKE THE FIELD GOAL!!! Your alignment is like a the foundation of a building. If the alignment is off then you cannot build on top of it. No matter where you are on the field, you should always align yourself with the target point!! Do not be lazy about this.......it could cost your team the game!!!!! What is the purpose of taking steps? Is it simply to look like you know what you are doing? So your alignment is correct. So you always are the same distance from the ball no matter where you are on the field. Are your steps the same every time? Are they repeatable under stressful situations? Are you close enough to the holder so your timing will allow the ball to not get blocked? Take normal steps backwards, do not reach or lunge. Draw a straight line from your kicking foot through your target point. Step at a 90 Degree Angle to the side. The 90 Degree Angle is important because every kick should be a straight kick. No matter where you are on the field you will be lined up in the same spot. Not only should the placekicker have calmness of mind, it is extremely important to stay calm, quiet and solid with your body position throughout the kick. At the contact point, The body should be in a position where the eyes and chest are slightly behind the hips and ball. The ultimate goal being to transfer momentum through the ball at contact. The best way to achieve maximum leg speed and compress the ball ins to let the hips and leg lead. Never crunch your upper body and contact! This will inhibit your ability to follow through properly and increase you chances of "cutting" the ball. The ultimate goal in generating consistent contact and distance is to develop a rhythm that is repeatable. Transferring momentum through the ball is key for maximizing leg speed and strength. This is no different in Golf or Baseball. Think of your rhythm through the ball as a building process. "2-4-6-8-10". Start slow and build to fast. You should always allow your body to be in the correct position at impact where your leg and body are working together. In order to to this, most kickers need to develop rhythm and tempo. Your first step should be slower than your last step. The follow through should be the most explosive. If you start too fast towards the ball on your first two steps, it will increase the likelihood that your body will be past the ball at impact and you will have to spend time on your plant foot waiting for your leg to catch up to contact. After making contact with the football, the momentum of the body should be going toward your target. Hips, Leg, Body. Spend as little time as possible on your plant foot by making contact as soon as possible. This will help transfer your momentum through the ball. Let your leg lead you with a high follow through toward your target. Hip follow your leg. Body follows hips. The plant foot position is the glue that allows the pieces of your technique to work, conversely, it also is the cause of our technique falling apart. It is important to have your body in a correct position at impact to maximize momentum and leg speed. If your plant foot is not in the correct placement, the body will make adjustments which will negatively impact your kick. At impact, the plant foot should be far enough away from the ball to allow your body to stay in proper position and your leg to freely lock out through the ball. A good rulle of thumb is the length of your foot away from the ball. Wider is better! The size of the block or tee you use will determine how far forward your plant foot should be. The taller the tee the further back your plant should be allowing your hips to get through giving you the ability to hit the ball on the upswing. 2" Tee - Ball should be even with front of foot. 1" Tee - Ball should be even with middle of foot. Ground - Ball should be even with heel of foot. If your plant foot is too shallow (too far back), it will inhibit your ability to get your hips through the ball and you will be have to spend too much time on your plant to reach for the ball. You will lose distance because your hips won't be involved and it will increase the likelihood of wrapping the ball. 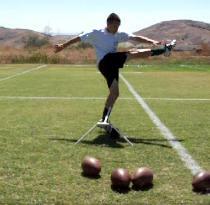 If your plant foot is too deep (too far forward), it will cause you to be late at contact with your kicking leg. This will cause you to chop down at the ball creating a "cut" with too much rotation. Your body will also adjust by opening your hips which will further cause a "cut". Just like in soccer, the plant foot should be pointing to the target. This will allow you to keep your hips and body square to the target, activate your quad muscles and keep momentum toward the target after impact. Proper timing of "Leg Lock"position at impact by utilizing and engaging the quad muscles is essential in creating leg speed and continuing momentum. Activating the largest muscle group in the body is essential to creating high levels of leg speed, which translates into more distance and elevation. We want to use our quad as much as possible. To do this is important to turn your kicking knee toward the target and keep the hip in alignment. This will allow for activation of the quad. Flexing of the quad muscle just before impact creates greater compression of the football. Think of a baseball player at impact of a baseball. Everything should be locked out. Biomechanically, this will give us the most force through the ball. Never open your hip and turn your knee to the sideline! This will put more stress on the groin (which is a smaller muscle) resulting in the "cut" rotation and opportunity for injury. Ideally, the proper backswing had a 90 degree angle at the knee to slightly more acute. The hip should remain square to target and not open to the sideline. By isolating the quad and not allowing for too much hip movement, there are less moving parts and less chance for error. Too much wind up can cause timing issues at impact resulting in a "cut" or "wrap" of the ball. As soon as the plant foot hits the ground, the quad should flex. In a perfect Leg Lock Position, the kicking leg is locked out slightly before contact and the kicking foot is even with the plant foot heel. This will allow for proper drive through the ball and upswing motion. Failure to lock out in proper position will result in a downward chopping swing at the ball, causing a "cut". Proper ankle lock and position of your kicking foot is essential for good rotation and the ability to kick off the ground. To make proper contact with the ball, it is important to not "wrap" the kicking foot around the outside of the ball. 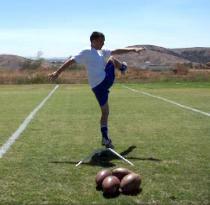 In order to do this, the kicking ankle should be locked to allow the toes to be down and out. With your foot in this position it will be easier to hit the sweet spot on the football. The heel of your kicking foot should be about 1" off the ground and your foot should be rolled over toward the target to activate the quad. Heel Up Toe Down will cause a "cut" rotation or low trajectory. The Skip enables your momentum and follow through to continue toward your target. It will feel very uncomfortable at first, but with consistent practice, it will allow you to put more speed and energy through the ball. The momentum of your approach, the dynamic action of the leg lock at contact and the acceleration of your follow through should naturally make you plant foot come off the ground. By allowing your plant foot and hips to release after the kick, you can channel all of your energy toward the target. This will result in greater explosiveness and distance. The timing of the skip is key. All of the elements of the approach, lockout and follow through must happen before you release your plant foot off the ground. The more efficient and better you get at timing up all of these elements together, the higher, straighter and further the ball will go. Very important---The lockout comes first, then the follow through, then the skip. The better you get at timing up your leg lock with the plant foot the more efficient you will become with the skip. As soon as the plant foot hits the ground....Make contact with the ball.....Then release your plant and hips to your target. Proper follow through is a combination of all the elements of your approach, contact and skip. The follow through is essential to accelerating through the ball and finishing toward the target. A good follow through is down the target line, leg locked out and at least parallel to the ground. Acceleration through the ball is important to maximize distance and elevation. A good follow through finishes high and with the kicking leg at the target line. Hips should finish behind the leg and belly button toward the target. Swiping across the ball will result in a leg and body working your body's momentum to the sideline. Opening of the hips before contact will cause you to swing across the ball. Bad tempo (running too fast) to the ball will not allow you to finish high to your target.